An instant classic when first published in 1991, How to Lie with Maps revealed how the choices mapmakers make—consciously or unconsciously—mean that every map inevitably presents only one of many possible stories about the places it depicts. The principles Mark Monmonier outlined back then remain true today, despite significant technological changes in the making and use of maps. The introduction and spread of digital maps and mapping software, however, have added new wrinkles to the ever-evolving landscape of modern mapmaking. 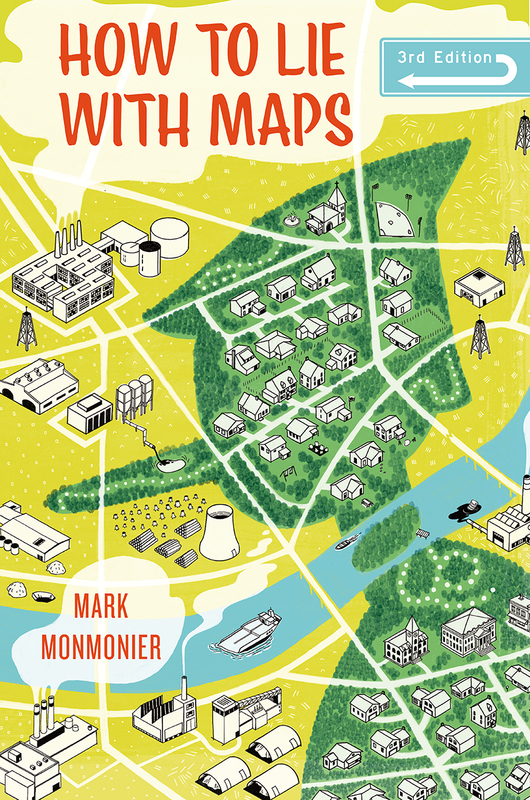 ​Fully updated for the digital age, this new edition of How to Lie with Maps examines the myriad ways that technology offers new opportunities for cartographic mischief, deception, and propaganda. While retaining the same brevity, range, and humor as its predecessors, this third edition includes significant updates throughout as well as new chapters on image maps, prohibitive cartography, and online maps. It also includes an expanded section of color images and an updated list of sources for further reading. "Still a bible for cartographers." "Monmonier, in his book How to Lie With Maps, points out that while American students are often taught to analyze words—to be 'cautious consumers' of them—they are seldom taught to do the same with maps. Persuasive cartography reveals how maps manipulate and should be regarded with a critical eye, a lesson that’s perhaps even more important in the present political climate." "A useful guide to a subject most people probably take too much for granted. It shows how map makers translate abstract data into eye-catching cartograms, as they are called. It combats cartographic illiteracy. It fights cartophobia. It may even teach you to find your way. For that alone it seems worthwhile." "This unusual book shows how cartographers distort the information they present—accidentally and deliberately." "A humorous, informative and perceptive appraisal of a key source of information that most of us have always taken for granted." "Will leave you much better defended against cheap atlases, shoddy journalism, unscrupulous advertisers, predatory special-interest groups, and others who may use or abuse maps at your expense." "The prose is clear, easy to read, and sparkles with erudite humor." "[Monmonier] has a sharp critical eye, but his primary purpose is constructive – he wants to make better maps and have us use maps more intelligently. He writes well about the history of maps because he can easily put himself in the mind of the map-maker and see things much as they saw them. His first thought is for practical problems; his admiration is for elegant solutions." "How to Lie with Maps continues to be inviting and readable, concealing detailed introductions to critical cartographic concepts beneath a veneer of humorous and casual prose...All maps lie, and Mark Monmonier continues to serve as an able guide for readers at any level to begin the process of informed cartographic interpretation and engagement."